MORGANTOWN, W. Va. (October 3, 2018) - MX Sports Pro Racing and NBC Sports have announced the 12-round schedule for the 2019 Lucas Oil Pro Motocross Championship, sanctioned by AMA Pro Racing. The 48th season of the world''s most prestigious off-road motorcycle racing series is highlighted by the addition of a new venue, WW Ranch Motocross Park in Jacksonville, Florida, which will host the inaugural Florida National on June 22. A total of 24 motos will provide plenty of drama and excitement in the 450 Class and 250 Class, where the world''s most prominent and up-and-coming stars will push their physical and mental limits in an all-out battle to win the most coveted title in motocross. The action will kick off as it has for 12 of the past 15 seasons, with the Hangtown Motocross Classic on May 18, before traveling across the country and to every corner of the U.S. on a championship journey that will visit 11 states. "The southeast has long been a hotbed for the sport of motocross, with a significant number of competitors calling the Sunshine State home, and we are committed to ensuring the region has a presence in the Lucas Oil Pro Motocross Championship," said Davey Coombs, President of MX Sports Pro Racing. "WW Ranch was a terrific venue for the USGP last year and received rave reviews from both the U.S. and European riders. It''s always been our hope to eventually make a return to Florida, and this track will surely become an immediate favorite amongst racers and fans alike." Reigning back-to-back 450 Class Champion Eli Tomac will look to join elite company in his quest to win the Edison Dye Cup for the third straight season, while newly crowned 250 Class Champion Aaron Plessinger will make his premier class debut, where he''ll join the likes of Marvin Musquin, Ken Roczen, Justin Barcia, and more in unseating Tomac. Plessinger''s departure from the 250 Class means that the Gary Jones Cup will be up for grabs, opening the door for the sport''s next star of the future to emerge. 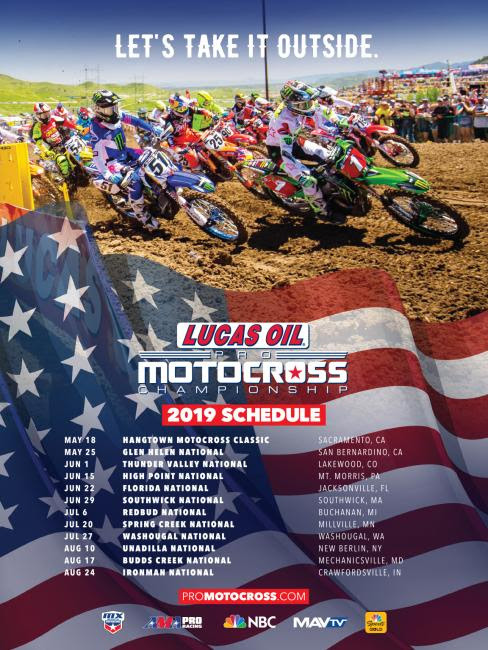 The Lucas Oil Pro Motocross Championship, sanctioned by AMA Pro Racing, features the world''s fastest outdoor motocross racers, racing aboard the best bikes each factory offers, on the roughest, toughest tracks in the world. The 12-rounds series begins at Hangtown in May and ends at Indiana''s Ironman Raceway in August. It includes stops at the premier motocross racing facilities in America, with events in California, Colorado, Pennsylvania, Florida, Michigan, Massachusetts, Maryland, Minnesota, Washington, New York and Indiana. The pro riders race on Saturday afternoon, with competition divided into two classes: one for 250cc machines, and one for 450cc machines. The Lucas Oil Pro Motocross Championship is managed by MX Sports Pro Racing, the industry leader in off-road power sports event production. The series is televised on NBC, NBCSN and MAVTV and streamed live on NBC Sports Gold. More information can be found at www.ProMotocross.com.